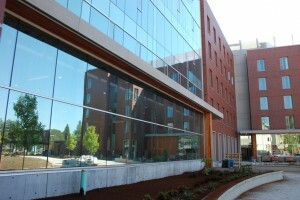 Scenes from the first day of classes at the new International Living-Learning Center at Oregon State University. Interviews are with Sydney Purdy, testing and learning center coordinator, and Rakan Alshannan, a mechanical engineering student from Saudi Arabia. Video by Graham Kislingbury of the Corvallis Gazette-Times. As we approach the opening of the ILLC on September 1st, we wanted to share some photos of the new building. 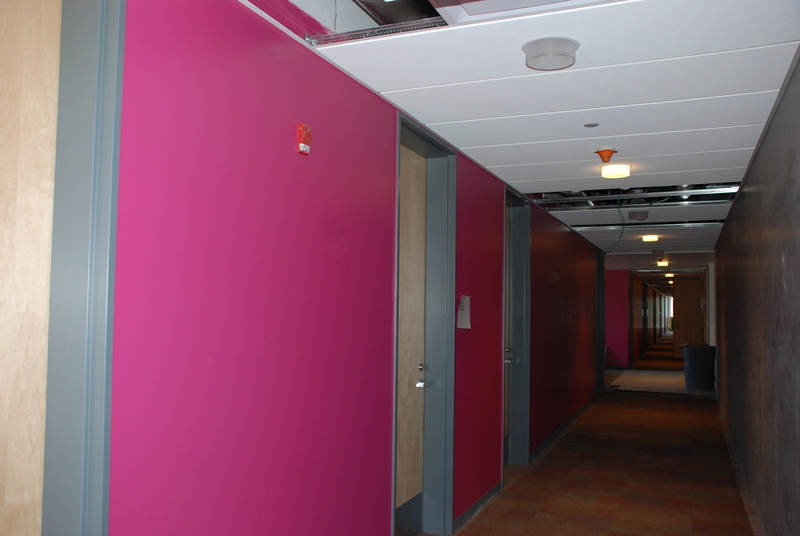 Be sure to check out the bright fun new colors on each of the floors — these colors coincide with the official color palette of INTO-OSU, our campus partner in the International Living-Learning Center. We’ve also got some great photos of the inside of a double room in the ILLC. 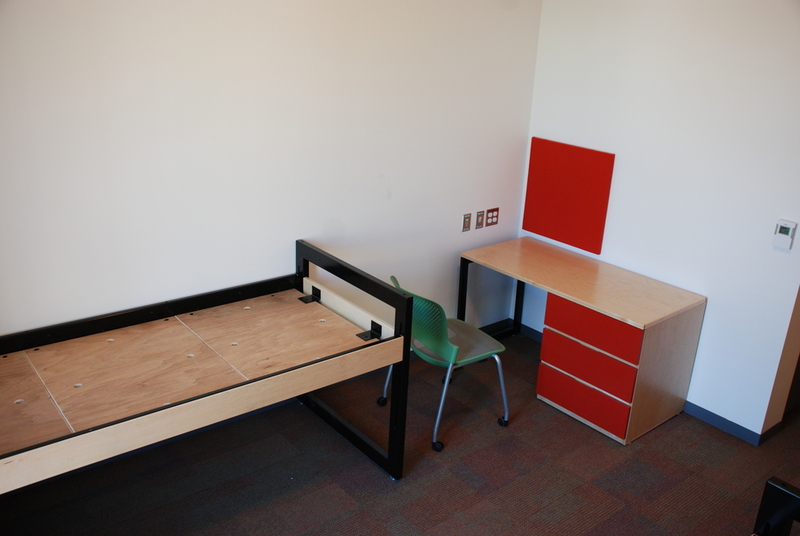 We’ve posted a video walkthrough of a double room. Check it out here! 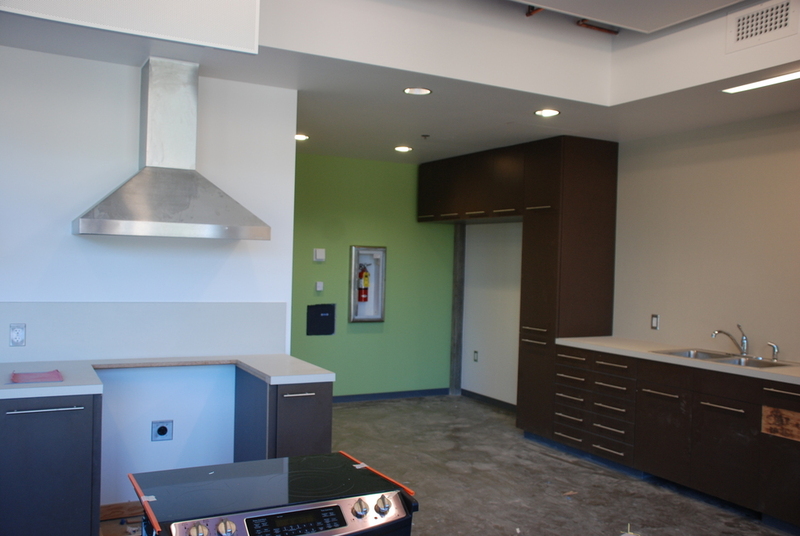 The first floor also has a great kitchen set up with two stoves, two refrigerators, a sink, plenty of storage space, and lots of counter space for cooking. The exterior is nearly complete. 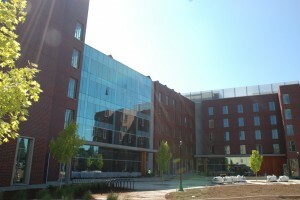 Most student residents living in the International Living-Learning Center will have a roommate from a country and culture different from their own. We’ve been getting some questions about what it means to have a domestic student as a roommate and what it means to have an international student as a roommate. This will be an ongoing learning process for all of our residents and will vary because people vary. That said here are some general things to think about if your roommate is from a different country than your own—and some general things to remember no matter where your roommate is from. First, let’s look at some general things to keep in mind about living with another human being. Flexibility, commitment, and willingness to communicate in an honest and tactful manner are all key qualities of creating a successful living environment with your roommate. Creating this will take time and effort—and it might be difficult. It will also be one of the most important things you learn outside of the classroom during your time at OSU. Sharing a space with another human being can be challenging with different personalities, class schedules, interests, and habits. The key is to remain open to learning from your roommate and situation. Keep asking questions. Seek to understand where your roommate is coming from and do your best to be kind. At the beginning of the year, you will work with your roommate and suitemates to complete a roommate agreement form. Filling out this form is a great way to talk about what you need to be successful and establish the way you want to communicate those needs throughout the year. Be honest and flexible as you work through the agreement. If you put the effort and time in, you will reap the benefits of creating a strong foundation for communication with your roommate from the beginning. This makes it easier to work through issues that come up later. When I studied abroad in Germany, I remember one of the most difficult things for me was communicating verbally and in writing with my floormates. I knew very little German, and their English was also limited. This might be something you encounter as well with your roommate. I will pass along some wisdom that was passed along to me: keep trying! Keep trying to speak the language. Your roommate will probably understand more than you think. It’s hard to believe that new students will be arriving on campus from all over Oregon—and the world—and moving into the International Living Learning Center (ILLC) in less than two months. The resident assistant staff and I are excited to meet you all! I am Dawn Snyder, and I will be the resident director in the ILLC. As a resident director, I supervise eight resident assistants (RAs), advise our hall government, and help students as they transition into living on campus and attending Oregon State. Whether you are from Tianjin, China or Oregon City, Oregon or Riyadh, Saudi Arabia or Southern California, coming to college will be a time of change. The RAs and I are here to help you navigate that change and OSU. University Housing and Dining Services will be teaming up with INTO-OSU and other campus partners to encourage your academic and personal success at OSU. 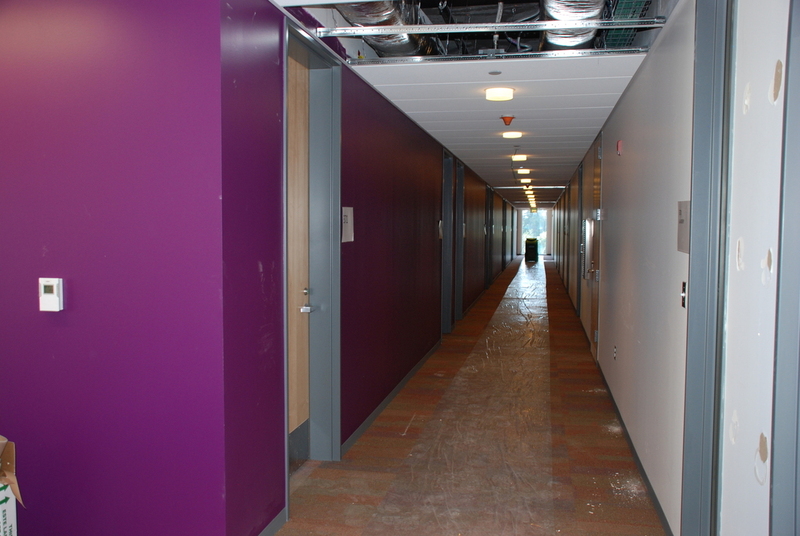 In the fall, writing assistants and math tutors will be available to residents on one night a week in the ILLC. The staff and I will be working with you and your roommate, suitemates, and fellow residents to help you learn about each other’s cultures and how to communicate effectively. The RAs and I will be checking in with you to see how classes are going and how you are adjusting. 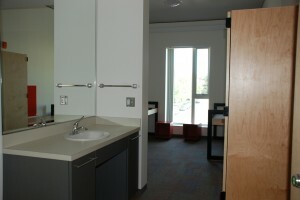 We want to do what we can do to help you make the most of living in the ILLC and thrive as students at OSU. 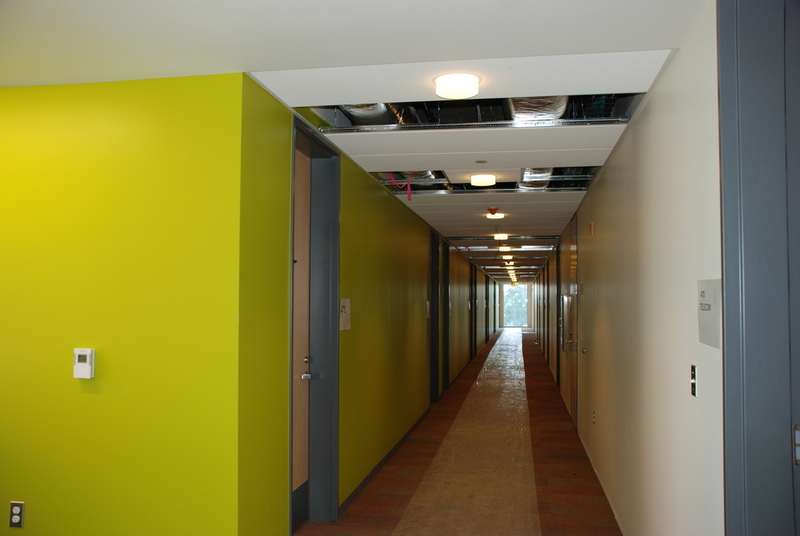 Each Friday at 1:30pm UHDS will be offering a tour of the new International Living-Learning Center to members of the University community. 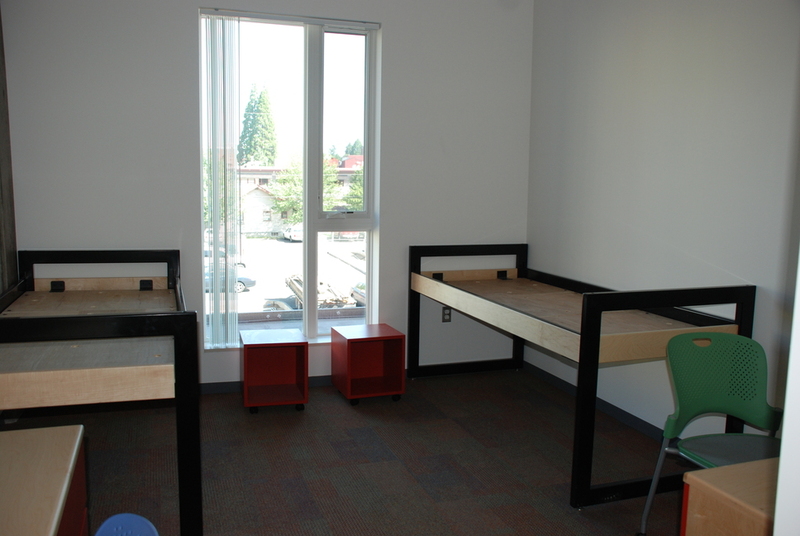 Reservations can be made in-person through the Arnold Service Center or by calling 541-737-0681. Each tour is limited to the first ten people to sign up and all participants must wear sturdy, close-toed shoes. For those of you following the construction, you’ll notice that most of the windows have been installed. Construction Crews are well under way framing the interior of the building and in some cases drywall has already begun to go up. Within the next few weeks the large glass panels in the center of the building will begin to be installed along with the glass alongside the coffee shop and market. With the September 1st completion date approaching, our Assignments and Room Management Office has begun incorporating building floor plans into the room selection system. 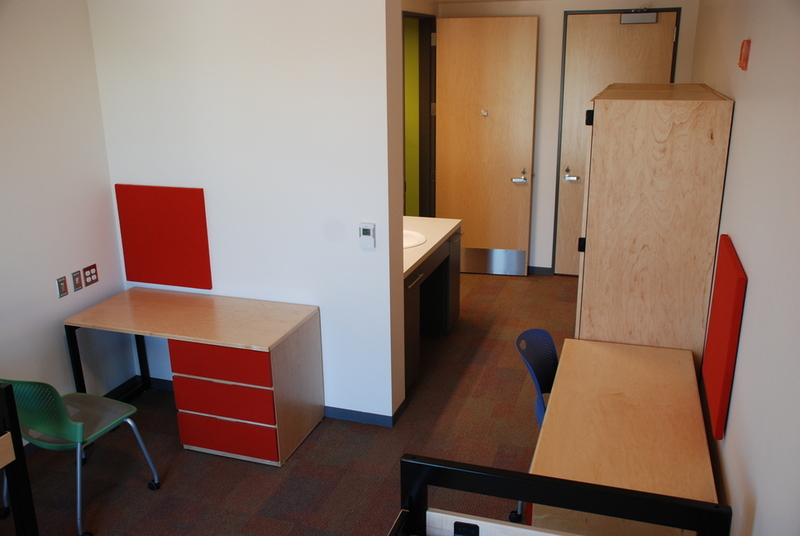 Students will be able to begin selecting their rooms later in March. 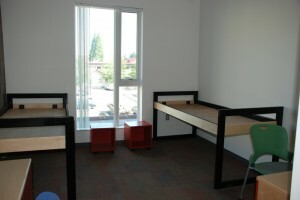 For more information about the room selection process check out https://uhds.oregonstate.edu/myuhds/. For a different perspective on the new facility, start checking for future blog posts from future building staff members! 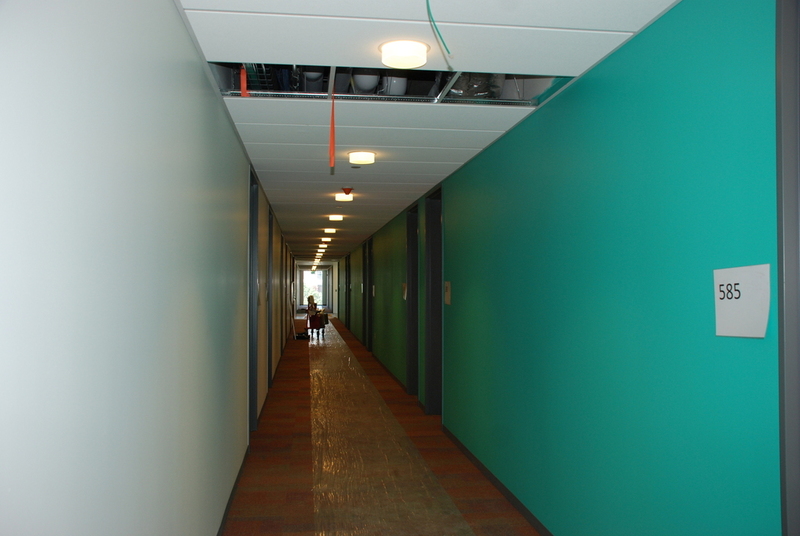 Running water: Some people have noticed what seems to be a water leak inside of the building. Believe it or not this is intentional. Allowing water to run over the newly poured concrete helps the concrete cure without cracking. Many of the floors throughout the building will left as exposed polished concrete, so it’s important that we start out right! Building name: Early this spring a committee comprised of representatives from UHDS and INTO-OSU met to discuss possible names for the new building. The committee has nearly completed its work and we are hoping that a name will be approved and annouced within the next several weeks. Sustainability: While the project team has decided not to pursue LEED certification though the United States Green Building Council (USGBC), the building is implementing a variety of sustainability measures that will be equivalent to USGBC’s LEED Gold rating. As work progresses, we’ll be sure to post another update. 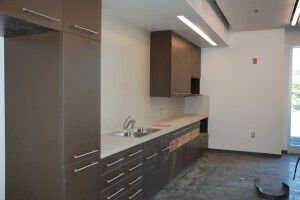 Please feel free to post any comments or questions about the project. This week construction crews will be hard at work to prepare for the pouring of the foundation. Critical tasks include running all of the utilities (water, electricity, sanitary) that will need to come up through the concrete slab to service multiple areas of the building, forming the concrete reinforcements, and installing temporary water and electrical service to the building site. 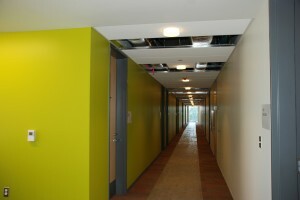 To ensure that we meet our construction milestones, crews will be working this Saturday (6/12/2010). None of the construction related activities are expected to have an impact on this weekend’s graduation events. 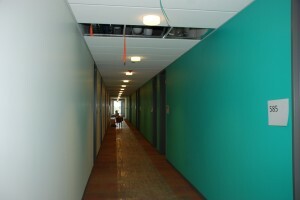 For May 17th – May 21st, 2011, please see the following for what construction will impact.